“Stress is not necessarily something bad – it all depends on how you take it. The stress of exhilarating, creative successful work is beneficial, while that of failure, humiliation or infection is detrimental.” —Hans Selye, pioneer in stress research. 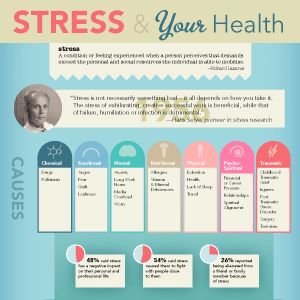 It is now believed that 80-90% of all disease is stress-related. And yet, a study cited by the China Daily Mail (2012) says that China is the most stressed country. 6 East Los Angeles, Calif.
1. Go out of body: Meditation, yoga, and tai chi can bring balance to your life. 2. Activate: Physically active people feel less anxious and depressed. 3. Join the Tea-Party: Cutting back on caffeine can also help since constantly stimulating yourself can drain your system. If you’re a coffee drinker, opt for green or black tea; these are healthier choices overall. Increasing your intake of omega-3 fatty acids (through fatty fish, flaxseed, fortified foods, or supplements) may help keep the stress hormone, cortisol, in check. 4. Improve time management skills: What causes stress is multitasking while doing things that give us pleasure. 5. Just say no. Get some R&R time. 6. Know thyself: Finding quiet time isn’t a luxury; it’s essential for protecting your health. 7. Herbal strength: A class of herbs called adaptogens keeps everyday pressure from wreaking havoc on your immune system. Dubbed the “king adaptogen,” eleuthero (also known as Siberian ginseng) has been shown to normalize blood pressure and blood-sugar levels and stop stress from draining your adrenal gland’s supply of vitamin C.
8. Combat computer overstimulation: A little nature therapy can also ease the stress of too much computer time. A stroll through a park counteracts overstimulation and can also boost your mood and energy. 9. Listen to the music: A number of studies show that listening to music, especially classical, may help you unwind. 10. Creating artwork and crafts can help relax your senses. *These drugs and medications are in some way related to, or used in the treatment of Anxiety and Stress. This service should be used as a supplement to, and NOT a substitute for, the expertise, skill, knowledge and judgment of healthcare practitioners. Check with your doctor before using.